Does NO sound like a mean or selfish word to you? Boundaries are important to your physical and mental health. 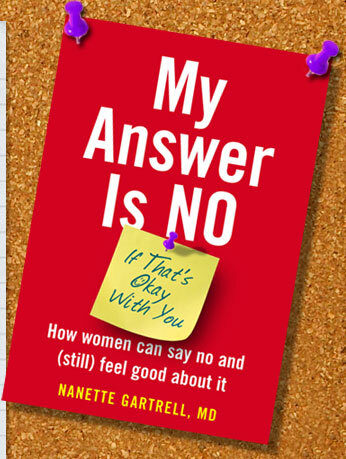 This book shows you how to find a good balance between caring for others and self-care through a step-by-step approach to saying NO without jeopardizing important relationships. Do you have trouble dumping a date who treats you badly? Everyone deserves to be treated lovingly and considerately as a fully equal partner. Chapter 3 teaches you how to stand up for yourself with dates and mates. Find out how prior losses influence your ability to say NO, and learn to set self-protective limits. When friends ask you to do something you don’t want to do, do you invent an elaborate excuse? However tempting it is to disguise the truth, honesty has a longer shelf life among friends. Chapter 4 teaches you how to say NO to your nearest and dearest. Is it hard for you to set limits when employees neglect their responsibilities? You'd like to be congenial, but it pushes your buttons when co-workers slack off. 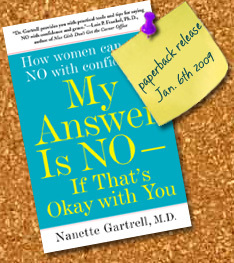 In Chapters 5, 6, and 7, find out how some of the most successful, powerful, and savvy businesswomen say NO in the workplace. Follow the step-by-step guides to setting limits with employees, co-workers, and even your boss. Do you have trouble even practicing the sentence, "NO, Mom, I just can't make it home this holiday?" There's no request more likely to stress you out than one from Mom or Dad. Talk about guilt if you refuse! Chapter 2 offers helpful tips on saying NO even to the most challenging parents. Dr. Gartrell discusses her book on talk radio and television and at book signings. Learn more. takes a fresh look at why even the most powerful, accomplished, and successful women find it difficult to say NO and offers a revolutionary approach to setting limits without jeopardizing important relationships.